Good evening all! I had so much fun making the bugs I think I will keep designing some more layered templates. Today I had time to make Prince, the googly eyed frog. The sample Prince was made in about 60 seconds using the template and these great felt styles by John Jones that I found on Adobe Exchange. 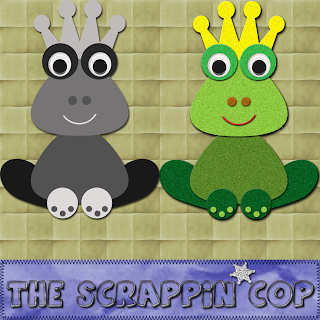 I just applied a layer style to each layer and viola, a felt froggy! I spent most of the day watching the Cubs win (yeah) and designing this silly jar that gave me fits. I've decided that if I owned the full blown Photoshop instead of PSE I could probably do so much more and do it so much faster and easier! I am about to make the plunge, just saving my pennies! Anyway, I used Mrs Miles Happy Canning Element which is a fabulous line art drawing as a template for the jar. 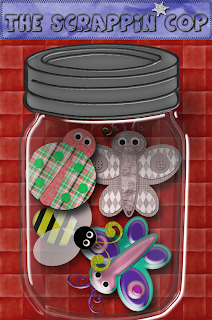 I added and "undid" a million and a half layer styles to the jar to make it look like glass. The best glass layer style I found was on Deviant Art by mycort. If I had PS, I could have scaled the layer style down and it would have been sooo much faster than putzing around with PSE. But anyway, it turned out okay (not great) and you are welcome to snag it for your previews or kits! Be sure to stop by Mrs. Miles blog and mycort's gallery to snag their awesome art! *hugz* hiya, they are all so cute, you make it soooo hard to be good and not snag lol.. So how is the camera going lol.. Thank you! Your blog post will be advertised on the DigiFree Digital Scrapbooking Freebie search engine today (look for timestamp: 21 Jul [LA 02:23am, NY 04:23am, UK 09:23am, OZ 07:23pm]). I LOVE your stuff! Thanks so much for sharing! What... no bugs in the jar? Sheesh... well, I'm not shopping here anymore!!!! PS... if I kiss the frog, will he turn into a prince?? love the jar! I will find so many uses for it! From an illustration type header to a farm, collection of stuff, buttons, anything! So great, and generous of you to offer this stuff for CU! WOW! I'm just running out of things to say! Every single treasure you create is indeed that - a treasure. And you are so kind to share them so generously. Just amazing. Thanks. These are wonderful! Thanks for the awesome jars! Thank you, this is cute!